The mockup, which surfaced today, looks more like an LG G Watch than a Moto 360. 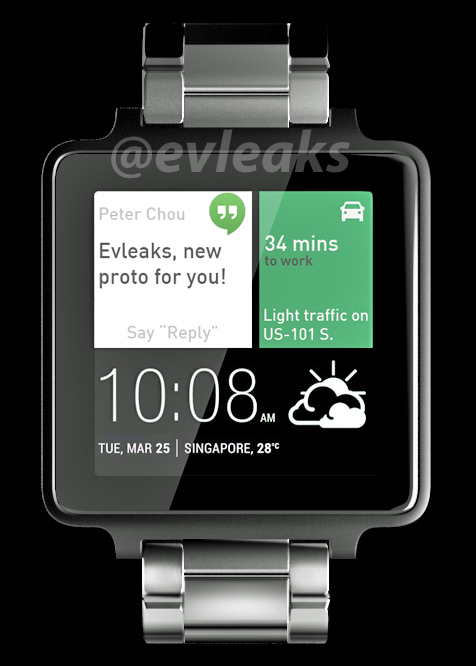 The source claims that it is an HTC Android Wear Smartwatch and it is based on the details that are leaked. This isn't the actual render obtained by @evleaks, but rather a reproduction of it. It's possible the original would have compromised a source, but he doesn't go into detail on that. Either way, the hardware is apparently faithful to the original. The real leak didn't have anything on the screen, so @evleaks decided to have some fun and put something HTC Skinned on it. Wear can't be skinned. It is originally published by @evleaks, the mockup shows off a metal wristband and square display with a thin black bezel. The smartwatch has a split-screen user interface with three panes showing the date and time, weather, traffic and a Hangouts notification. The Samsung Gear Live and LG G Watch remain the only Android Wear smart watches currently available for purchase.